Peace-Carriers are people who in their immediate social environment work as catalysts for mutual understanding and comprehension between communities and thus promote peace, cooperation and integration. They communicate respect, mutual appreciation and acknowledgement. They have changed their attitude towards the “enemy” and assume responsibility for the transformation of interpersonal and social conflicts through their own example and their voluntary work. Their objective is the well-being of all people, across all borders. Friendship Across Borders also trains professionals with a background in social work, education or psychotherapy to serve as Mentors. Mentors accompany and support Peace Promoters in their own personal development. We also organize seminars aimed at evaluating and further developing our tripartite Peace-Carrier approach. In this five-day seminar, five people from each respective country met to learn and practice how to guide trilateral groups through a process of trust-building and improved communication skills. All participants had previously participated in FAB’s trilateral work. 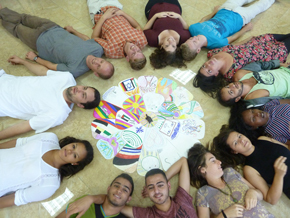 In groups of three, an Israeli, Palestinian, German prepared short sessions for the whole group as a leadership team. In this way, all participants were actively involved in the emotional labor of these processes, for which they themselves were responsible. One moment they occupied a facilitator position, but in the next moment they were again simple participants. This complex and challenging task, which sometimes led to explosive situations, demanded creativity, responsibility, and improvisation skills. Historical traumata and current conflicts were always present in the space and tested the leadership potential of each participant. In between, Krondorfer led feedback sessions, discussing the dynamics of conflict and trust, offering observations about the current group situation, and enriching the leadership practice with theoretical models. 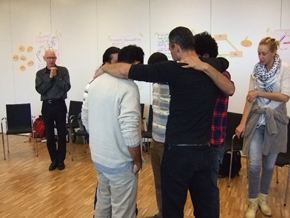 This unique facilitation experience allowed the group to feel in intimate ways the reality of the conflicts while being asked at the same time to be responsible for moving the process forward. It would be worthwhile to repeat this facilitation training again in the near future. 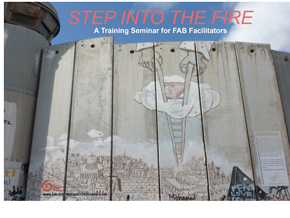 This time, the group consisted of four Israelis, six Palestinians and eight Germans, from their early twenties into the late sixties, some with experience in previous FAB seminars, other newcomers. As it turned out, I was far from alone with my skepticism: several others, in particular Palestinians, but also Germans came with their own reservations about the seminar and its ambitions. They found the first two days tough going. In our work in the whole group, or in smaller groups, reasoning prevailed over listening and empathizing, we repeatedly stumbled into discussions about historical rights and wrongs, and there was palpable resistance to opening up all around. On the morning of the third day, news reached us about an attack by three Palestinians on the entrance to the Holy sites on the Temple Mount in Jerusalem, known to Muslims as the Holy Sanctuary. The attackers killed two Israeli Druze policemen, and were then shot and killed themselves. Once more, we were confronted with the deadly realities of the conflict outside; once more, that helped concentrate minds and move on from there to where we wanted to go. To get there, it is necessary to open up and expose ourselves as human beings, with our vulnerabilities and flaws, our emotional baggage and our conflicted personal histories. Once that happens, reasoned arguments lose their importance, and empathy wells up. 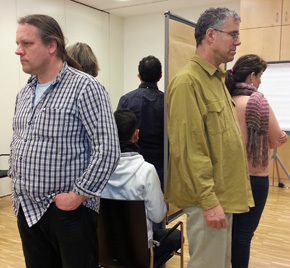 On this third day of the seminar, and into the following day, Björn Krondorfer made us work with a powerful technique called “living sculpture”. This technique consists of breaking into smaller groups of six to eight participants around themes (in this seminar, the themes were “dignity”, humiliation” and “fear”), which then have to work out how they can assemble themselves into a “living sculpture” that represents the theme in ways that one could envisage, as a sculpture, in a public place. Each group “performs” its living sculpture without giving explanations; the other two groups share their impressions and reactions with the performing group, which in turn reflects on their own emotional responses to their performance and the reactions it solicited. 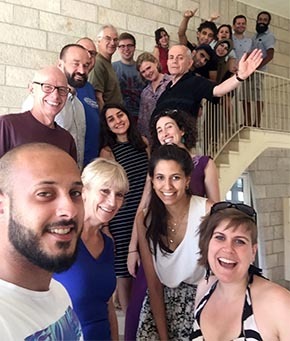 In the evening of the third day, in the context of this work, the whole group listened to a deeply moving, impassioned and earnest exchange between two of our initially skeptical Palestinian participants: they, and we all, had arrived at where Björn wanted to lead us: unsettling empathy. The seminar also confirmed, I think to all of us, the continuing relevance of our specific tripartite format. Not only are the Germans at the heart of the Jewish national trauma and therefore intertwined with the collective traumas of both peoples that today live and struggle in Palestine, the Holocaust and al-Naqba, the catastrophic displacement of Palestinians in the war of 1948. Their presence in those settings also allows for what Björn Krondorfer calls “triangulation”: breaking up a polarized conflict through introducing a third party as a catalyst. Each of the 3 groups had been prepared for this encounter in advance, in a number of sessions and meetings, by their national facilitators. Since over the last year the tensions between Palestinians and Israelis have increased (there were fatal stabbings), the students spoke about their fears and worries. In a safe atmosphere there was a lot of space given to witnessing and to listening to the personal stories of the participants. All participants had become involved in their own personal way, and they took a “little spark of hope” back home. What does it mean for a Palestinian teenager to witness that his friend next to him is being killed by Israeli soldiers? Or what does it mean that the father is taken away by Israeli soldiers and put into prison? What does it mean to grow up as a Palestinian child in a refugee camp and feel like a beggar, when asking for food from an international NGO and having no private space. Some of the Israeli group spoke about the inner conflict within their own society, and what it means to them. Travelling abroad, they would like to feel welcome as an Israeli instead of feeling rejected. Some of them feel like strangers in their own society, which they think of as a “sick society”. And yet, they want to live securely in this society without constant fear of a terror attack. The German participants expressed their concern about the increasing racism and neo-Nazism in their own society. They also spoke about the “burden of the past”: the grandfather of a participant had been stationed during the Second World War close to the place where one of the worst massacres of Jewish people took place during this time. He did a lot of research and developed the deep wish that “the horror of the Holocaust never should be forgotten”. A bus tour in the West-Bank brought the reality of the daily life in an occupied territory into the seminar: when our group met a woman settler who acted in a provoking way towards us and who finally called the nearby soldiers for help, the Palestinian students felt threatened and full of fear. A few hours later a very different meeting took place for the students: they had a very inspiring meeting with the founders of a growing local Palestinian Israeli Peace Initiative for Understanding, Non-Violence and Transformation (ROOTS): Hanan, a Jewish Rabbi, Zionist and Settler and Ali, a Palestinian who provides his land for encounters “with the other” (Ali´s Land). Being creative together in different ways deepened the process of opening up for “the other”: like forming a “human sculpture” together in order to portray the topic of “national identity”; like forming sculptures out of clay about the topic “Hope and Despair”, or having an intercultural evening together. In one exercise the participants confronted each other in a respectful way with loaded words such as “Zionism”, “Naqba” “Nazi”, “Victim”, etc. 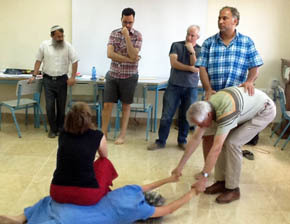 In this exercise an Israeli soldier who had been stationed in Gaza during the last Gaza War 2014 and a Palestinian participant who had lost 15 relatives in Gaza during this war, told each other about their experience of fear and despair – and while doing it, felt seen and recognized by “the other”. Video of the seminar Oct.2015 / 15min. This year’s seminar was about feeling the own and collective borders which hinder us to be open for other concepts, to approach other people, and to reach out hands for peace. All participants showed each other their own borders and thus made clear how much borders affect and burden all of us. At the same time, borders are important, in order to give us support and security. While stories with personal exclusion within the own biography touched all participants, collective borders were experienced to be oppressive and mighty. Once again, it became clear how much the consequences of World War II, the Holocaust, and the Nakba determine emotions and influence and limit us until today. We could feel the painful dilemma between keeping the own borders which protect identity and living space on one hand, and crossing these borders on the other hand, in order to open new spaces of common ground with others. A simple solution through mere decision is not possible, but more likely a readiness to agree to a slow process of mutual approach. Usually the left wingers are from Tel Aviv, but last month it was different. The Israeli leadership of Roots, Hanan Schlesinger, Shaul Judelman and Myron Joshua, together with Ali, met a delegation from FAB led by Avner Dinur from Sderot and including other Jewish and Palestinian FAB members, some of them part of the Holy Land Trust of Bethlehem, which has a long standing relationship with Roots. The interaction between the different constituencies, respectful from beginning to end, was fascinating and enlightening. It was important to see how much we have in common, and that we have the language and the tools to listen to each other and to understand each other even when we disagree. After three hours we felt that we barley scratched the surface and that we ought to find a way to continue the dialogue. 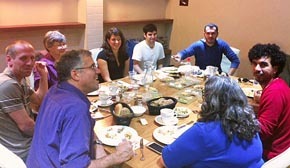 In the midst of the Gaza ground war, FAB convened an intergenerational seminar in Talitha Kumi in Palestine – one of very few meetings which brought together Israeli Jews and Palestinians (and, in our case, Germans) without a specific political protest agenda and for several days. That it was possible to assemble our group of four Palestinians, six Israeli Jews and six Germans despite the torrents of hatred and fear which swept both Israeli Jewish and Palestinian societies and the temporary cancellation of international flights into Tel Aviv was a remarkable testimony to the strength of FAB and its past achievements: against all the difficulties, participants made their way to our meeting in search of a place where they could feel safe and at peace with themselves and the others. Upon joining us, one Palestinian participant reported how difficult it had been to come: he just had lost fifteen relatives in Gaza to Israeli air attacks. Others, both from Palestine and from Israel, described how difficult live had become for them in an environment of intolerance, hatred and fear in their family and at their workplace. Yet we were able not only to meet but to move forward in our effort to build a space of safety and peace through mutual trust and friendship. On our “open day” on Sunday, Aug. 3, the guests from outside who joined us to learn about our work were clearly both impressed and fascinated by this achievement. This was an unusual meeting: twice our carefully prepared agenda was overthrown, as the grim background noises of hatred, fear, violence, destruction and death intruded, unleashing powerful emotions. Our original plans had to be changed to accommodate the psychological and emotional needs of the day. We did so, and found in the end that while we did not achieve completely what we had planned to do originally with this meeting, we got something probably more valuable: we could confirm that FAB had been able to build reliable foundations for peace amongst ourselves in the past, and we were able to take further important steps forward. How can we facilitate international and intercultural encounters that move between memory work and management of current conflicts? During the workshop-seminar, the participants will learn how the multifaceted interrelations between traumatic memory and political conflicts can be addressed and transformed within intercultural group work. It was VERY important and exciting to have our meeting today. Many topics came up that are important to explore - e.g. relations between Jews and Palestinians within the 1949 armistice line, dialogue versus activism, expanding the circle. To come up with a plan that meets the needs of all - that includes doing something concrete for moving the messages of peace and the end of the oppression of the Palestinian people forward. We agreed on re-sending the link to the petition to end the blockade on Gaza so that whoever hadn't signed it yet could do so with a MAJOR request to please send it on to anyone who you think might want to sign. So far there are 1080 signatures, but there is no way enough! In a deeper exploration each group discussed and performed the actual national obstacle in front of the plenum. This work on the own resistance was a new step within our work in FAB. All participants emphasized on the importance to continue and deepen this work. This seminar was also attended by some new members and former students and started with critical reflections about our previous work in FAB. Special attention was given to the clarification of group dynamics against the background of political tensions in the Middle East, and to ways for continuing FAB’s work if the political situation should escalate further. Using creative methods like sculpture work, we were able to envisage the basis for a continuation of FAB’s work, and work out next steps and new projects. Special attention was put onto the clarification of the group-dynamic within the current politically tense situation in the Middle-East leading to the question what could be helpful in case a political escalation occurs. The two nations, coming out of the conflict-area introduced „loaded words“, such as zionism, independent state of Palestine into the circle of the three nations, and opened up the space for the opinion of the other. The seminar was attended by a guest from the University of Neubrandenburg. The university would like to incorporate the Peace Carrier Training in the curricula for their students. Discussions were held about cooperation of the University with FAB and about how such a program could be established. This meeting was expanded from the original final student meeting into a reflection and planning session on the future work of FAB. The background to this decision was the development of the political situation (the settlement policy of the Israeli government and the anti-normalisation policy of the Palestinian leadership), which made it impossible for Palestinian students to attend this meeting. Venue and date for the meeting also had to be shifted. Eventually, two Palestinian members were able to join and to explain the situation. Together, the meeting then explored future possibilities of continuing or work together. For the attending students this was the last international meeting. Concluding sessions in national settings followed. 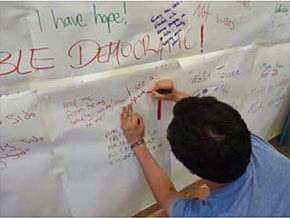 Israeli and German participants expressed their joint attitude towards the political situation through a protest banner (see picture). Development and strengthening of relations between the national groups and individual FAB members; reflections about individual and national loyalities. Exploration of diverging commitment among participants and Mentors within the course work produced deepened insights into and a better understanding of the different social conditions in the daily lives of Palestinians, Israelis, and Germans, as well as of cultural differences between them and their influence on our joint work in FAB. The aim of the seminar was to encourage participants to open up to the difficult and sensitive issues resulting from our common German-Jewish past, which continue to complicate the dialogue and inhibit the meeting of hearts and minds between Germans and Jews. 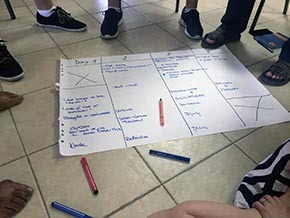 An assessment of subjects which continue to remain taboo for Germans and Israelis was followed by reflections and discussions about the present meaning of the Holocaust in Germany and Israel. Sculpture-work in mixed groups about the subject „What are we allowed to forget and what should be remembered“. Special format of constellation-work: „The spirit coming out of the box of oblivion/forgetting“. 29 th Apr. 2011, Workshop of the 5th International Conference Würzburg "Conflict Transformation and Mysticism"
FAB International. Public Relation (PR). Presentation of the vision and the goals of FAB. Joint work with sculptures: Participants in the seminar and FAB members created three groups; each agreed on a sculpture to express their national identity; this was followed by analyses and interpretations of the differences and parallels between the sculptures. 26th –28th Apr. 2011, Frankfurt/M. The aim of this seminar was to familiarize participants with the nature of traumatic experiences, its effect on the individual and at the collective level, and ways to heal them. Gina Ross, the well-respected psychotherapist and founder of the International Trauma-Healing Institute, USA, and the Israeli Trauma Center in Jerusalem, lectured on the characteristics, classification and stages of traumatic experiences. Two days of group and pairexercises on trauma work were held under the professional supervision of Gina Ross and their assistants, using the trauma therapeutic method of „Somatic Experiencing“ developed by Peter A. Levine. FAB Student Training 2010/11 part 2 34 min. Initiation and organisation: Brigitta M.M. 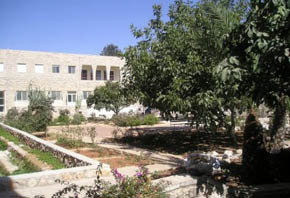 Mahr, Mamoun Kassem. In this second seminar, the prospective Palestinian, Israeli, and German Peace-Carriers explored the Israeli-Palestinian and Jewish-German past. Together they visited Yad Vashem, the Holocaust memorial in Jerusalem. The students walked through the museum in groups composed of one Palestinian, one Israeli and one German participant, accompanied by a Mentor. In this way they were better able to exchange their impressions to support each other. During the visit of the villages Lifta, Sataf, Al Qastal and Al Malhah, which were destroyed during the „Nakba“, participants were confronted with the Israeli-Palestinian past. Together, the students listened to memories from the past and learned how the land of the former villages is used today. It was especially moving to hear that quite a few of the displaced Palestinian families still retain the keys to their abandoned houses, passing them on to the next generations as a sign of their hopes for their return. FAB Student Training 2010/11 - part 1 UT EN 16 min. This seminar formed the core of the 2-year Peace-Carrier training program. 24 students, 8 from each group, took part. A parallel process was organized for the group of Mentors. The participants had already prepared for in their respective national contexts. They had thus gained a deepened knowledge about the Israeli-Arab conflict and the Holocaust, and they had acquired skills in intercultural communication. They also had explored their own and their family biographies and reflected on their own personal attitudes towards the conflict. The main aims of the seminar were to listen to the views and to understand the perceptions of the other sides in this trialogue; to gain a deeper understanding of conflict dynamics, to remain in contact and stay in dialogue with the others despite painful memories, prejudice and traumata, preserving their own capacity to empathize with others; and to explore together viable paths to oppose violence and contain its effects in violent surroundings. “Loaded words” exercise: Dialogues on phrases loaded with conflict potential, which easily trigger emotional reactions. Exercises on communication, conflict management and active listening. “Witnessing circles”: Sharing personal experiences of fear, violence and its effects. While one group was talking, another was listening and the third supporting. Systemic Constellations Work: Individual and collective fields of conflict were explored and worked on. Excursion to Jerusalem: Visit of historical sites and museums, which included some debasing experiences at checkpoints for the Palestinians, although they had a special official permission for this visit. Further elements: Memory work, sculpture work, meditation exercises, reflection units, cultural evenings, soccer and dance, planning of peace-supporting activities and preparations for the return to the normal daily surroundings and difficulties at home. Key ingredients for the success of this seminar were the mix of different approaches and methodologies, the fact that there was enough time for national groups to meet on their own, and the strong support by our Mentors who were experienced in trauma work. 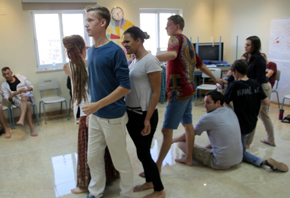 New participants and Mentors from the Palestinian territories and from Israel, mainly from the South around Sderot, met for the first time with Germans. Work with sculptures: Every group agreed on a common ensemble of body postures meant to illustrate different aspects of their respective national identities. Comparison and discussion of the differences and similarities of the three sculptures. Planning for the joint preparation of the first international training program in 2010. Meeting of German members with the intention to clarify their own personal, cultural and national background and their position within the trilateral framework of FAB’s Palestinian-Israeli-German peace work. Starting by exploring their own cultural roots and family upbringings, the perspective was then broadened to the tri-partite approach of FAB by introducing standpoints from the other groups. Discussion, definition and agreement on the internal and external structure of FAB. First outline of the international training program. FAB Mentors – Pilotproject 2007 / Trailer 7 min. The purpose of this seminar was to introduce the Mentors, who had not met before, to come to know each other through intense personal encounters. Thus, they were able to gain a deeper understanding of the dynamics of conflict in the Middle East, to connect with each other and work together as a group, and to familiarize themselves with their tasks as supporters of the students in the Peace-Carrier-Program. Under the guidance of the Facilitators, the participants followed the process of the students in their later training. The purpose was to change the „hostile view“ towards the other group and to develop a firm orientation towards peaceful cooperation. Dr. Albrecht Mahr, founder of the Institute for Constellation-Work and Integrative Solutions, in his work with the group brought out the continuing relevance of past aspects of the conflict in the Middle East and experiences from the time of the Holocaust and World War II. 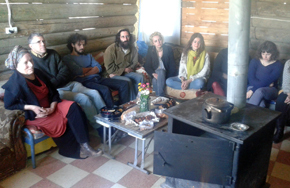 Following the method of "Compassionate Listening", Palestinians, Israelis and Germans also were able to share personal experiences with each other that had affected their own life and work, as well as that of their families. Further methods: Work in mixed groups of three, in national groups, an arts project and informal gatherings. In the final gathering all participants emphasized the importance of their experiences and the necessity to continue the work. Configuration of Friendship Across Borders e.V. 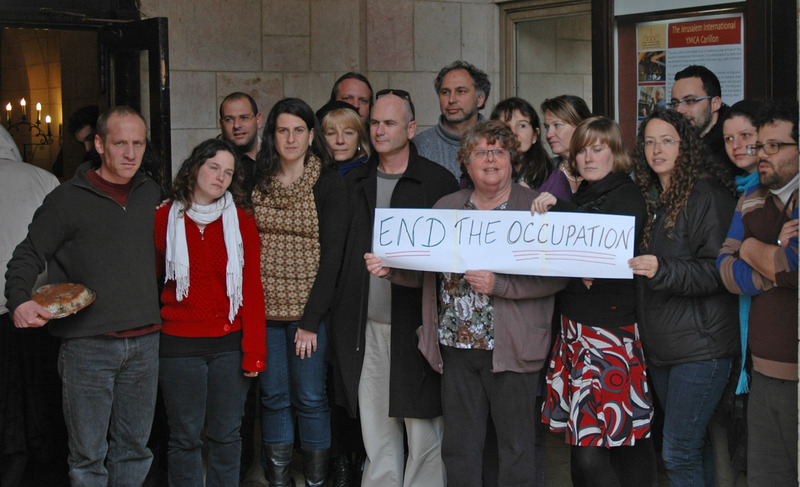 Basic work to organise and establish an Israeli, Palestinian and German group. Exchange and development of common targets concerning the future work of FAB. Preparation and planning of the pilot project "Let me see through your eyes“.